I know this isn't drive-in related, but I thought that it deserves recognition. About 1/2 way between Baraboo and Sauk City on US 12 is a place called Delaney's Surplus. Behind Delaney's is some of the most unusual creations that I've ever seen. There are multiple items that have been created from scrap metal and other items all welded together into different forms. All of the items on display are incredible to look at. Some range from items only about a foot tall to the main center piece that stands probably 30 feet tall and 80 to 100 feet long and 30 to 50 feet wide. 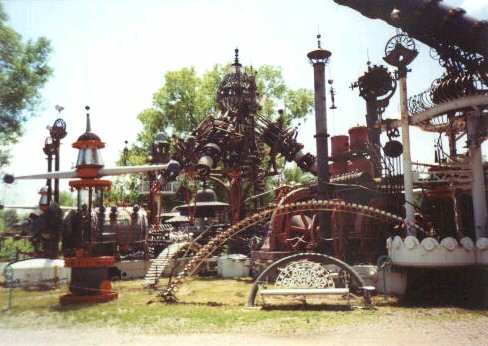 It all consists of scrap metal and other materials welded into fantastic art. If you get the chance, you just have to see this. It's located on the opposite side of the road from the main entrance to Badger Ordinance.